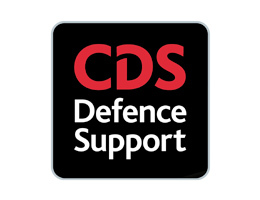 Army REDS take a very large step forward. Army Rugby Union Head Coach Captain Andy Sanger MBE always knew when he planned the 2018 season that the first week in February would be one that by 1400hrs on Saturday 3rd he would have a better understanding of who was putting their hand up higher than others to be in his Inter Service Squad that he is due to announce after the Team have played the British Police on Wednesday 14 February in East London. 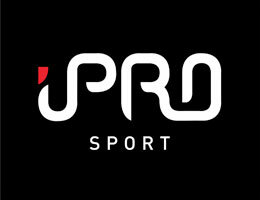 Two games in four days is always a tall order, but current strength in depth allowed him to pitch a Team to play Oxford University on Wed 31 January that had a great mix of youth and vast experience. Having defeated Cambridge University well two weeks ago he knew Oxford would be ‘up for it’ and he is not often wrong. 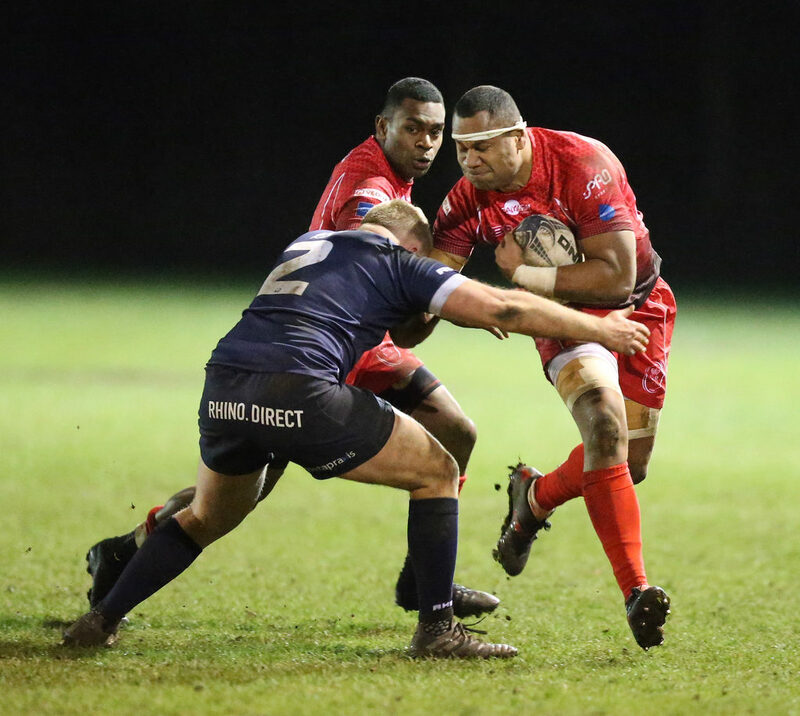 The dark Blues had 10 caps from the Varsity match in their starting line up; the REDS only had three senior players including the tireless Cpl Peceli Nacamavuto RE who still has all the class of an outstanding centre that he has displayed for the past thirteen years. 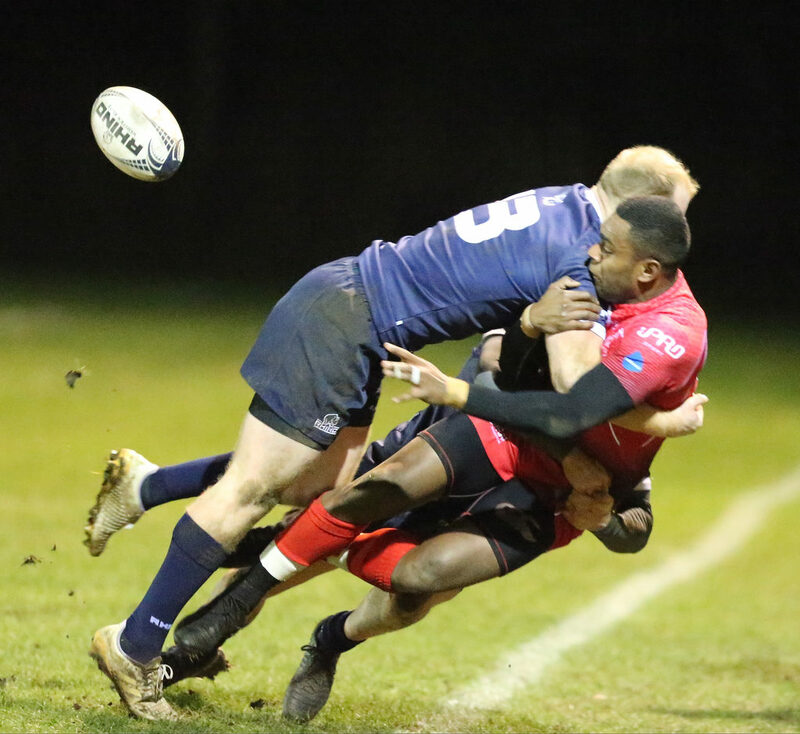 Oxford knew they had a chance and were very positive in their movement and patterns of play, the Army team who had not really gotten to know everyone’s first names featured many of this seasons U23 and Academy players. 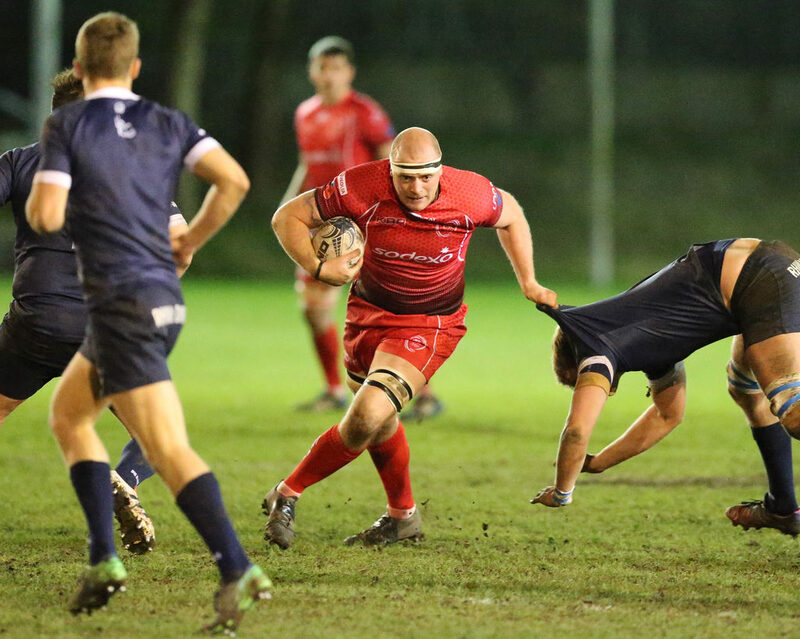 A pacy first half had the Army lead at half time 14 – 5 with 2 well worked try’s from Gunner Richards. The second forty was just as entertaining, the dark Blues were soon on the score card again bringing it back to 14-10 cheered on by a good crowd at their famous ground. The next fifteen minutes had both teams probing each other’s Defence but it was the Army who broke the dark Blues line with ten minutes to go when LCpl Steff Wilson went over in the corner after a period of sustained pressure. As quite often occurs in these situations in wasn’t long before Pte Boginisoko RLC smashed over, with Wilson adding the extra two. Oxford weren’t done however and pounded the REDS line until with the clock on 80 minutes they produced a well worked backs try to close the match 17-26 to the Army. 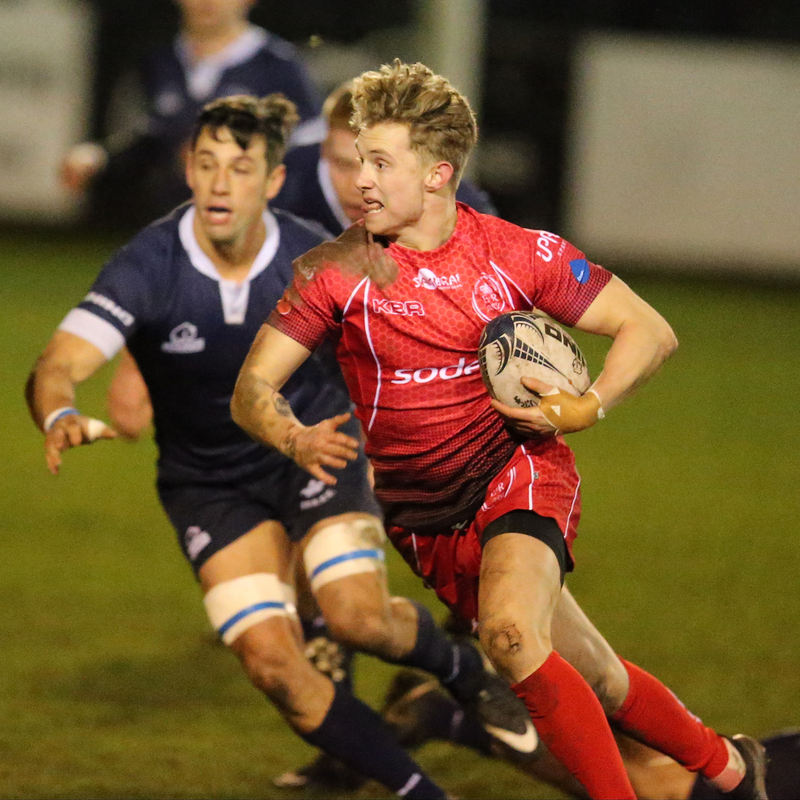 The two University fixtures against Cambridge and Oxford date back many a year and are a great proving ground for all to stake their place in a RED shirt. 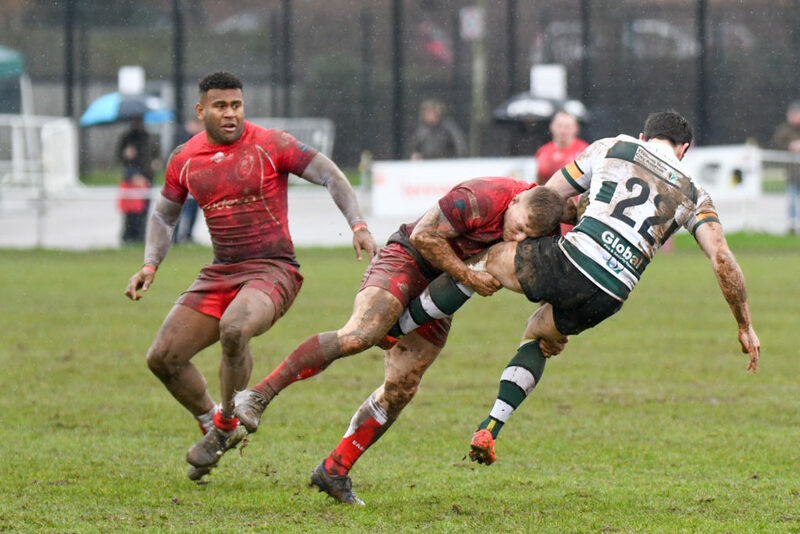 Move on three days and up the M1 to a cold and damp Nottingham Rugby Club. 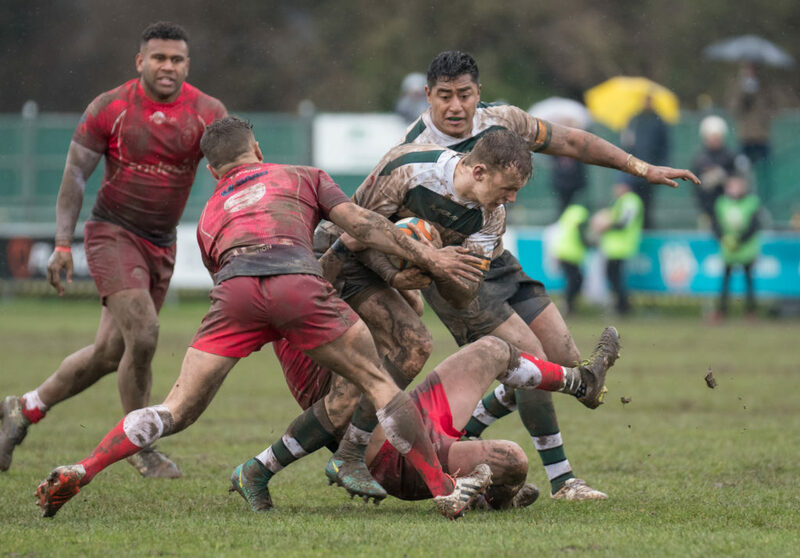 Nottingham are a proven Championship team and the two sides had ‘previous’ when the Army had invited them to Browns Portugal in 2017 as part of the Inter Services preparations, that day the Green and Whites had enjoyed a hot dry track and won comfortably by three scores, this was going to be a total change with a heavy pitch and constant drizzle, not a day you would have thought for running Rugby. A good crowd had braved the elements and many were still in the bar by the time the REDS had opened the scoring with Captain Stu Cross York’s and Pte Junior Bulumakau Scots showing that the Army weren’t just there to make up the numbers, with skipper LCpl James Dixon converting both try’s the REDS were 14-0 up after seven minutes and Nottingham players and coaching staff didn’t know what had hit them….. 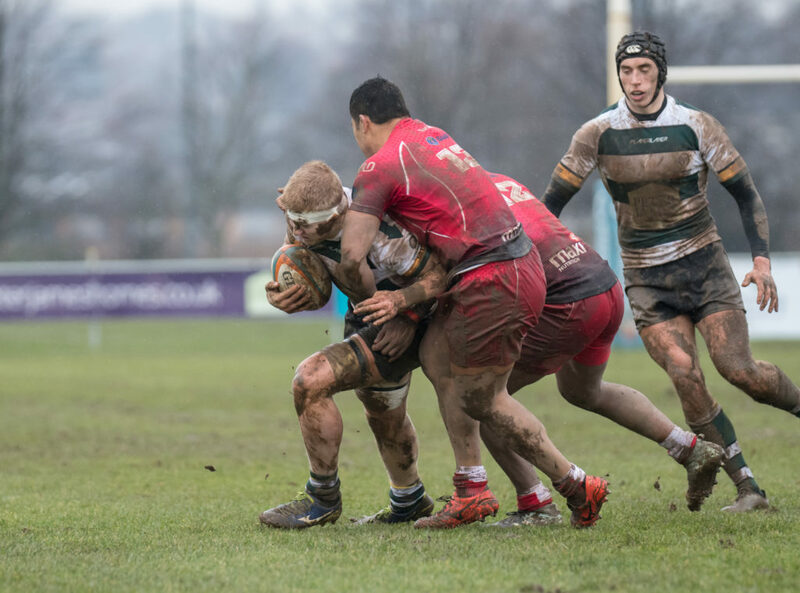 The home side are not in the Championship by chance, they are a solid and well drilled team with powerful and skilful players, who immediately responded with a sustained period of pressure on the Army defensive line. Much work has however been done in this area and it was to be a defining element of their play that would shape the rest of the match. 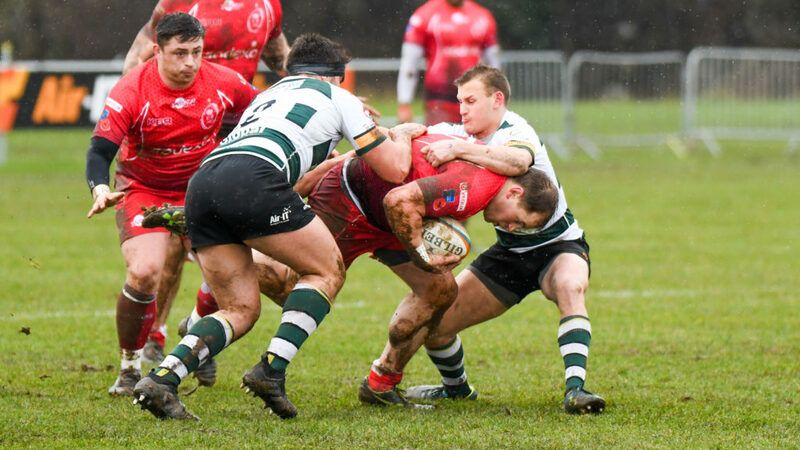 After 3 penalties close to the Army line the referee awarded a penalty try and the Green and Whites were back in the game; seven minutes later the home side were level with a clever grubber kick to flat foot and eager Defence. Both sides had now got the measure of each other, the REDS forwards were an equal match to the large powerful Nottingham pack, Cpl Lewis Bean Rifles and Cpl Ross Parking didn’t take a backward step, the front three were just as solid with Cpl ‘Turkish’ Titchard-Jones REME, Bdr Pete Austin RA and Sgt Ken Dowding RA all working tirelessly to ensure every Nottingham attacked was met with two RED defenders. The back row of Cpl Matt Dawson Int Corps, Cross and Capt Millar AAC were just everywhere and with 30 mins on the clock it was the back row that over turned possession from a Nottingham counter attack to release Sig Rav Fatiaki R Signals to breech the home sides try line, Dixon again added the extras and the REDS were back in front 21-14. That lead lasted just 2 minutes before the home side again crossed again with a well worked backs move to level it and both sides headed for the warmth of the changing rooms with the scores level at half time. The second half was a case of let’s see who had the stronger bench and who would falter on the ever increasing soft and heavy track. Nottingham came out all guns blazing. A half time Coaches chat had clearly focused the home side, again the REDS Defence time and time again held strong and many of the Nottingham driving attacks were halted in their tracks and from one such attack half way through the second half the ball ended up with LCpl Chris Leatham just inside his 22m line, he’s a player that loves to spot a gap, in fact he spotted five gaps and burst fully 45m up the pitch leaving Green and White defenders sprawling on the floor; a long and accurate off load to Gunner Craig Edwards RA sprinting in support had the pacy winger just beat a desperate covering tackle by the Nottingham full back and the Army were back in front, Dixon again converted and the lead was back to seven 28-21; moments later he added a further 3 from a penalty and with 15 minutes to go the REDS had stretched their lead to 31-21; was this going to be a famous upset? Nottingham had other ideas, some timely replacements brought on clean shirts and fresh legs, with 10 to go they had closed the gap to just 3pts with a piece of brilliance of their own, they weren’t done; two minutes later with the Army running on a ‘quarter of a tank’ the Nottingham side crossed again, however they missed the conversion and held a slender 2 point lead, 33-31; this was shaping up to be a grandstand finish, the Army forwards got their ‘fifth wind’ and somehow surged back into the Nottingham 22; Penalty Army, step forward skipper Dixon, corner or posts, the Penalty was in the softest part of the field that resembled by this stage a mud pie, Dixon chose the posts, he had been excellent with his boot all game. The kicking tea sunk into the mud as he lined up his kick, thud; the Ball flew between the posts………..but was two metres below the cross bar, what an effort, and that was that. Full time and Nottingham held on for a victory that they will admit was never a given. 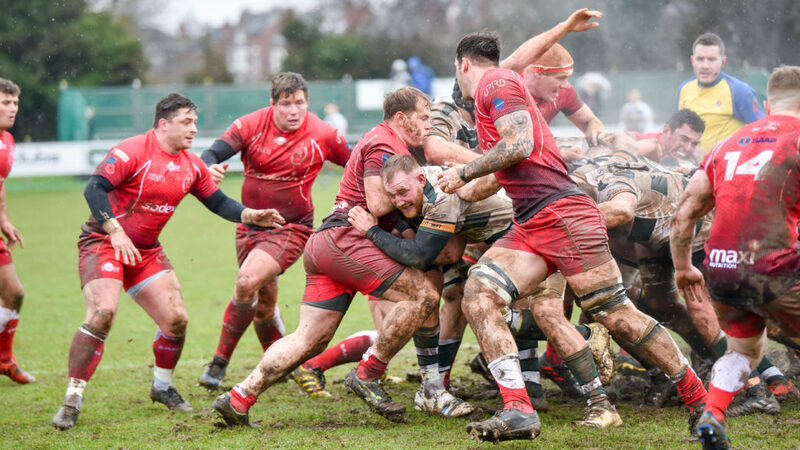 The Army played out of their skins, every player to a man put in an outstanding effort, hot showers warmed the team before we joined our hosts to watch Six Nations Rugby and enjoy each other’s company. Bravo Nottingham, great hospitality! Same again next year?